Enjoy Affordable Luxury Detroit Lakes Hotel Lodging. Best Western Premier The Lodge on Lake Detroit offers the latest hotel style and amenities in the Detroit Lakes, Minnesota area. 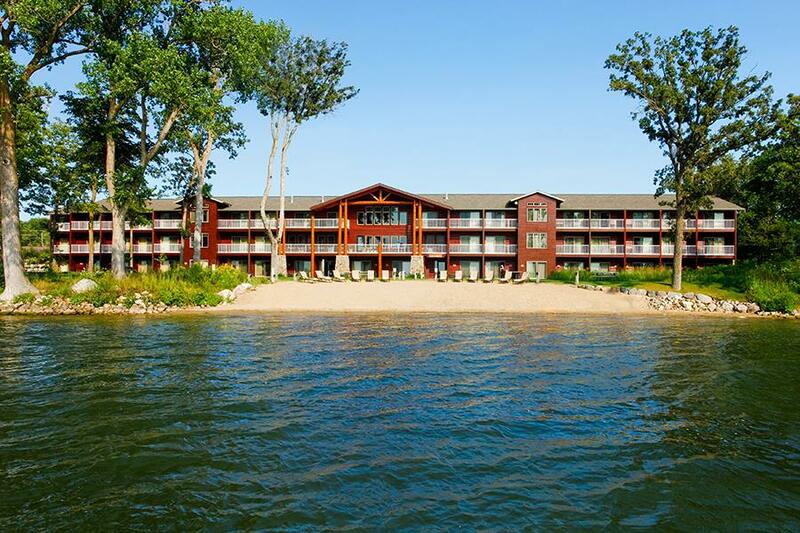 Located on the shore of pristine Big Detroit Lake, Detroit Lakes newest Minnesota lake resort features dramatic sunsets and is nestled in a lovely tree-filled setting with eco-friendly rain gardens, guaranteed to enhance your stay. Your day spa, Lake Detroit style, is waiting at our Detroit Lakes resort hotel. We believe you should be pampered on vacation, and feature The Spa Within, the only day spa in Detroit Lakes. Choose from our menu of delectable treatments to have you looking and feeling your best. All rooms are lakefront with patio or private balcony. Renewal Spa Suites feature a whirlpool and fireplace, ideal for a little romance. Check out a complimentary kayak or paddle boat for water recreation, with boat slips and a private beach steps away. Outside fire pits are the perfect place for making smores and a favorite gathering spot for friends and families. Enjoy music, fun, good food and drinks at The Lodge. We regularly host live music in our lakefront, fireside lobby, as well as wine tastings, special retreats and murder mystery events! The region is a favorite for destination weddings, and we welcome many business travelers and meetings to our Detroit Lakes hotel, too. Employees of BTD, Lakeshirts, Snappy and the healthcare sites, including St. Marys Hospital, Sanford Health and Essentia Health are all regulars here. Many guests prefer to relax on our private sandy beach, or with outdoor activities like biking, snowmobiling, fishing and bird watching. The Tamarac National Wildlife Refuge is a must-see for nature lovers. WE Fest, a country music festival, is a local favorite, as are the annual Street Faire Festival, Water Carnival and Beardsley Half Marathon that all take place nearby. Reserve a room at Best Western Premier The Lodge on Lake Detroit today! From: East on US Hwy 10. Turn left from US Hwy 10, onto East Shore Drive. The Best Western Premier The Lodge on Lake Detroit is located on the left (on the lake) side. From: West on US Hwy 10 E. On US Hwy 10 E, 2.5 miles from downtown Detroit Lakes. Go three miles east on US HWY 10 E from junction of Highways 59, 34 and 10. The Best Western Premier The Lodge on Lake Detroit is located on the right (on the lake). Turn right at East Shore Drive by gas station. 8.00 mile(s) from Little Easy, full service, American, open for: dinner, located at the Detroit Country Club, overlooks luscious golf course greens. County Road 22, Detroit Lakes, MN 218-847-2512. Choose from Italian, steaks, seafood, pizza and more. 2.10 mile(s) from Chinese Dragon, full service, Chinese, open for: lunch, dinner, located in Washington Square Mall. Offers a Chinese food menu for lunch and dinner. Take out available. 808 Washington Avenue, Detroit Lakes, MN 218-847-2177. 2.00 mile(s) from Burnsides Char House, full service, American, open for: dinner, 1218 Washington Avenue, Detroit Lakes, MN. Dinner and buffet options, as well as a full service bar area. 2.10 mile(s) from Godfather's Pizza, full service, American, open for: lunch, dinner, dine in or carry out. We also deliver. 712 - 1/2 Washington Avenue Detroit Lakes, MN. 218-847-3999. 2.10 mile(s) from Pizza Hut, full service, American, open for: lunch, dinner, located in Washington Square Mall. Dine in or carry out. We also deliver. 218-847-1336. 3.60 mile(s) from El Metate, full service, Mexican, open for: lunch, dinner, restaurant and lounge feature lake view of Little Detroit Lake. Outdoor and indoor seating. 720 West Lake Drive, Detroit Lakes, MN 218-844-5333. 1.70 mile(s) from Miguels, fast food, American, open for: lunch, dinner, Mexican restaurant. Drive up or eat in (limited seating). Cash & carry. They do not accept credit cards. 915 Lincold Avenue. Detroit Lakes, MN. 2.80 mile(s) from Perkins, full service, American, open for: breakfast, lunch, dinner, Perkins family restaurant is open 24 hours. 1.70 mile(s) from Central Market Deli, deli, American, open for: lunch, deli located in 24 hour grocery store. Variety of soups, sandwiches, hot foods, salads, fresh bakery items, meats, cheeses. 14.40 mile(s) from Billy's Bar & Grille, bar/lounge, American, open for: lunch, dinner, 158 East Main Street, Vergas, MN 218-342-2451. This casual bar & grill specializes in burgers. Sports bar with televisions to catch the game. 2.00 mile(s) from Lakes Brewed Awakening, coffee shop, American, open for: lunch, 910 Washington Avenue. Detroit Lakes, MN 218-847-5104. Offering coffees, drinks, sandwiches, soups, bars. 1.70 mile(s) from Quiznos, fast food, American, open for: breakfast, lunch, dinner, dine in or take out submarine sandwiches, personal pizzas, soups. Driving range - 6.00 mile(s) from Lakeview Executive Golf Course, picturesque course featuring large greens, with traps bordering all 18-holes. Opened in 1980. A club house, driving range, practice area and green are all part of the Lakeview Complex. Water activities - Water sports Guests enjoy complimentary use of kayaks and paddleboats. Local marina has other boat rentals available. Sunbathing - Sunbathing, 150 feet of private sandy beach along 500 feet of lakeshore. Lounge chairs available. 2.30 mile(s) from Washington Square Mall, located on Washington Avenue. Includes a variety of retail stores, coffee shop, restaurants and movie theater. 1.70 mile(s) from Land O'Lakes, offers local cooperatives and agricultural producers, agricultural supplies. Leading marketer of dairy based food products for consumers, foodservice professionals & food manufacturers. 4.00 mile(s) from Becker County Fairgrounds, annual county fair with carnival typically takes place for three or four consecutive days, the last week of July. 35.00 mile(s) from Shooting Star Casino, and event center in Mahnomen, MN on White Earth Reservation. 5.00 mile(s) from Richwood Winery, is based outside of Richwood, which is just ten miles north of Detroit Lakes. They are one of the newest wineries in the state of Minnesota. The winery & vineyard is located on an acre of land overlooking Buffalo Lake. 2.50 mile(s) from Washington Square Cinema 5, located in Washington Square Mall. 2.60 mile(s) from Historic Holmes Theatre, located in the Detroit Lakes Community and Cultural Center, brings music, drama and dance to the lakes area. Features a year round schedule of professional touring shows and events. 5.00 mile(s) from WE Fest, annual country music festival held at Soo Pass Ranch, founded in 1983. Typically held Thursday, Friday and Saturday of the first week in August. ~34 miles from Detroit Lakes. ~51 miles from Detroit Lakes.